The Bedford Community Health Foundation has completed their fall grant cycle, with $57,000 in grants. Funds were awarded to 9 local non-profits who provide health care or health-related services to Bedford residents. This makes a total of $200,000 invested back into the community this year. 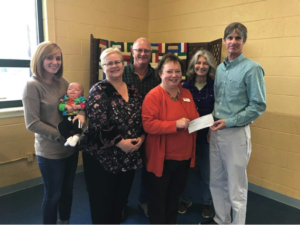 Grant recipients include CASA (Court Appointed Special Advocates), Centra College of Nursing , Bedford Domestic Violence Coalition, Food for Kids, Lutheran Family Services of VA, Lake Christian Ministries, SML Good Neighbors, Sedalia Center, and the Roanoke Rescue Mission. Below: Denny Huff presents a check to the staff, volunteers, and board members of the Sedalia Center. The funds will go towards the expansion of the Children’s play area.